Fully revised and updated and now with new Discovery Tours chapter. Marco Polo California: the Travel Guide with Insider Tips! 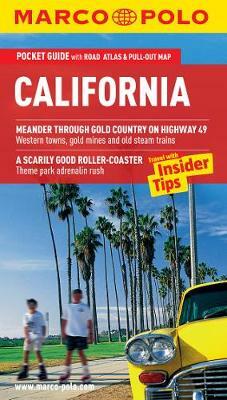 Experience all of California's attractions with this up-to date and authoritative guide, complete with Insider Tips. Most holidaymakers want to have fun and feel relaxed from the moment they arrive at their holiday destination that's what Marco Polo Guides are all about. You'll discover hotels and restaurants, trendy places to go and the best nightlife spots, as well as tips for shopping and what to do with kids. Further sections include: Festivals & Events, Travel Tips, Links, Blogs, Apps & more, and a comprehensive index. The Streets of San Francisco, Mickey Mouse, Hollywood, Napa Valley, Yosemite, giant redwoods and golden beaches, the list of California's attractions is endless. You might think you know it all ready from movies and TV, but the reality is much more colourful, flashy, quirky and above all beautiful. With MARCO POLO California experience a holiday that mixes hip urban culture with the glamour of celebrity and a real-life road movie with awesome scenery, and the Insider Tips reveal where you can still find Love & Peace and where trees grow like cathedrals. Panels in each chapter suggest things to do if you're on a tight budget and where you might pick up some real bargains. The Best Of pages highlight what's currently in vogue in California, recommend things to do for free, and have tips for rainy days and where you can relax and unwind. The Trips & Tours section takes you from the wild coast and mountains of the north to the surfing paradise of the south, whilst the Dos and Don'ts explain why you should avoid certain city neighbourhoods, amongst other precautions. MARCO POLO California provides comprehensive coverage of all parts of the state. To help you find your way around there's the detailed Road Atlas, a useful map of San Francisco in the cover, plus the pull-out map. A must-have for all travellers, including those who haven't bought a travel guide in the past.